After a period of sustained improvement, the upstream sector ended a politically tumultuous year on an unexpectedly somber note as oil prices skidded in the final months of 2018 amid oversupply concerns and signs of a cooling global economy. While these short-term trends have added a cautionary tone to some industry projections, a generally hopeful sentiment remains among analysts. Wood Mackenzie’s senior vice president, Tom Ellacott, for one, believes the upstream sector will thrive this year. The midstream sector, meanwhile, roared into 2019 on a wave of pipeline construction activity driven by the continuing global shift toward natural gas, the rapid growth of shale production, and the infrastructure demands created by changing patterns of interregional trade. The latter is particularly true of the United States, where the lifting of an oil export ban and the predicted growth in global LNG demand has led to massive infrastructure development, particularly along the Texas and Louisiana Gulf coasts, including oil and LNG export terminals, new and expanding liquefaction facilities, and the pipeline capacity to supply them. The latest survey by sister publication Pipeline & Gas Journal, based on Energy Web Atlas data, indicates 145,353 miles of pipelines were planned or under construction worldwide at the start of the new year – and North America accounted for 36,087 miles of that total. The survey indicated that 9,542 miles of pipeline are under construction in North America and 26,545 are planned. While pipeline construction has increased throughout North America, the heaviest activity has been concentrated around major U.S. shale plays with takeaway capacity constraints – most notably, the Permian Basin of West Texas and New Mexico and the Marcellus/Utica basins of Appalachia. Pipeline capacity from the gas-rich Marcellus increased in 2018 with the completion of Columbia Pipeline’s Leach Xpress, which added 1.5 Bcf/d of capacity from West Virginia in January, and Williams’ Atlantic Sunrise project. A $3 billion expansion of the Transco system, Atlantic Sunrise added 186 miles of greenfield pipe in Pennsylvania and 1.7 Bcf/d of takeaway capacity when it began full operations in early October. The $5 billion, 600-mile (970-km) Atlantic Coast Pipeline is a 42-inch natural gas pipeline developed through a joint venture between Dominion Energy, Duke Energy, Piedmont Natural Gas and Southern Company Gas. The 1.5 Bcf/d pipeline, which has faced opposition and delays, is scheduled for completion in late 2019. Mountain Valley Pipeline officials said the $4.6 billion project is on target to be fully in-service in the fourth quarter of 2019. Mountain Valley, which spans 303 miles from northwestern West Virginia to southern Virginia, was reported to be 70% complete by the end of 2018, including 58% of all welding, and planned to finish remaining construction of compressor stations and interconnects by February. Additional Marcellus projects include Mountaineer Xpress, which will add 2.7 Bcf/d, and TCO’s Columbia Gulf and WB Xpress expansions, which will combine for up to 2 Bcf/d of capacity. Rover Phase 2 adds 3.25 Bcf/d to the Midwest and Ontario, and NEXUS Pipeline, which follows a similar route to Rover, will deliver 1.5 Bcf/d of new capacity. In the Permian Basin, more than 2 MMbpd of pipeline capacity has been proposed, and several of those projects have moved forward following successful open seasons that revealed strong customer interest. Production in the hottest U.S. shale oil play began pushing against takeaway capacity in 2017, causing tariffs to rise, and surpassed it during 2018. A number of major Permian projects are scheduled for completion during 2019, including the 730-mile Epic crude oil pipeline to Corpus Christi, Texas, which is developing into a major crude and NGL export hub. The Epic crude line will add 590,000 bpd of takeaway capacity, following the path the Epic NGL pipeline which also is under construction. Plains All American expects first flow on its Cactus II project in the second half of this year. Cactus II was proposed as a 585,000 bpd project linking Permian production to Corpus Christi/Ingleside via existing and two new pipelines. Due to customer interest, Plains conducted a successful second open season for expanded capacity. Cactus II is expected to start partial service in the third quarter of 2019, Plains is targeting full service on the 670,000 bpd line in April 2020. Other notable Permian crude oil projects include the Phillips 66/Enbridge Gray Oak Pipeline to Corpus Christi, Freeport and Houston. Gray Oak, which is scheduled to begin service in the second half of this year, will have an initial capacity of 385,000 bpd. Most recently, Houston-based Jupiter Energy Group commenced an open season in December for a 650-mile, 36-inch crude oil pipeline with expected completion by the fourth quarter of 2020. The pipeline would have capacity up to 1 MMbpd with origination points near Crane and Gardendale/Three Rivers in West Texas and an offtake point in Brownsville, Texas. Privately held Jupiter said it also is constructing a crude upgrading, processing and export terminal capable of loading VLCCs in the Port of Brownsville. The Permian pipeline shortage is not limited to crude oil production, however. With associated gas accounting for about a third of the Permian output and regulations limiting the amount of gas that can be flared, natural gas pipeline constraints have also put a ceiling on oil production while pushing gas prices in West Texas down to the lowest of any major U.S. hub. Fortunately, Mexico is providing a growing export market for piped gas from Texas, as its southern neighbor has been aggressively expanding its natural gas infrastructure. In 2012, according to Sener, the Mexican ministry of energy, there were 7,050 miles (11,347 km) of gas pipelines in Mexico, of which 5,665 miles (9,118 km) were operated by Pemex. Since then, 1,496 miles (2,410 km) of gas pipelines have been added to the national grid, and that total is expected to reach 5,420 miles (8,722 km) by the end of 2019. The 13 existing natural gas interconnections from the United States have an import capacity of about 4.2 Bcf/d, according to the International Energy Agency (EIA), with four of them interconnected to the Integrated National Transportation and Storage System: El Hueco, Cuidad Mier, Reynosa and Argüelles. By the end of this year, five additional interconnections are expected to start operations. A number of important gas pipelines from Texas and within Mexico have come on line over the past two years, including Enbridge’s Valley Crossing Pipeline, a 168-mile system that added 2.6 Bcf/d of capacity when it entered service in October, and TransCanada’s 348-mile, 670 MMcf/d El Encino-Topolobampo Pipeline, which began service in June. Canada began 2018 with about 42,000 miles (67,706 km) in service and added just over 200 miles (325 km) through November, but if all of the projects that are already approved or under review were to be completed, the country’s total mileage would grow by more than 8%. According to Canada’s National Energy Board (NEB), 3,628 miles (5,839 km) of pipeline projects have been approved for construction and another 2,807 miles (4,518 km) of projects are under review. Canada was producing a record 4.9 million barrels of oil per day at the close of 2018, the NEB estimates, but pipeline capacity to move crude to U.S. refineries has not expanded as quickly. Like their counterparts in the Permian, Canadian producers have struggled with steep price discounts due to stranded production in oil-rich Alberta – so much so that the province was reportedly in talks to buy rail cars to add approximately 120,000 bpd of capacity for about $263 million (C$350 million). By November, several Canadian crude producers had curtailed production and asked Alberta to mandate cuts for other producers. Last month, the Canadian government said it will spend C$1.6 billion ($1.19 billion), mostly through loans, to assist the country’s oil and gas industry that has struggled to move energy to U.S. markets due to pipeline capacity constraints. One major pipeline project that would address this problem is TransCanada’s Keystone XL, which would transport up to 830,000 bpd of crude from Alberta to the U.S. Gulf Coast. Despite being a lightning rod for environmental activists and the subject of numerous court challenges, TransCanada has remained committed to Keystone XL and continues to push the project slowly forward. In November, a U.S. federal judge ordered a halt to the project until another environmental review of Keystone XL, but ruled in December that some pre-construction activity could resume during the review including project development work and stakeholder meetings. Keystone XL is to be an 1,179-mile (1,897-km), 36-inch pipeline beginning in Hardisty, Alberta, and extending south to Steele City, Nebraska, where it would interconnect with existing pipe. The base Keystone Pipeline System went into service in mid-2010. The Trans Mountain expansion, which would nearly triple capacity on the line to 890,000 bpd, is another major Canadian pipeline projects that has suffered costly delays due to opposition – in this case, from inside and outside of government. The Canadian government agreed in May to buy the pipeline from Kinder Morgan Canada Ltd for $3.5 billion (C$4.5 billion), in an effort to ensure its expansion went ahead. The most recent estimated in-service date is December 2020. As part of the project, construction is already underway on an expansion at the Westridge Marine Terminal in Vancouver, with preliminary work being done at Kinder Morgan’s nearby terminal and tank farm. The 710-mile (1,150-km) Trans Mountain pipeline began service in 1953. 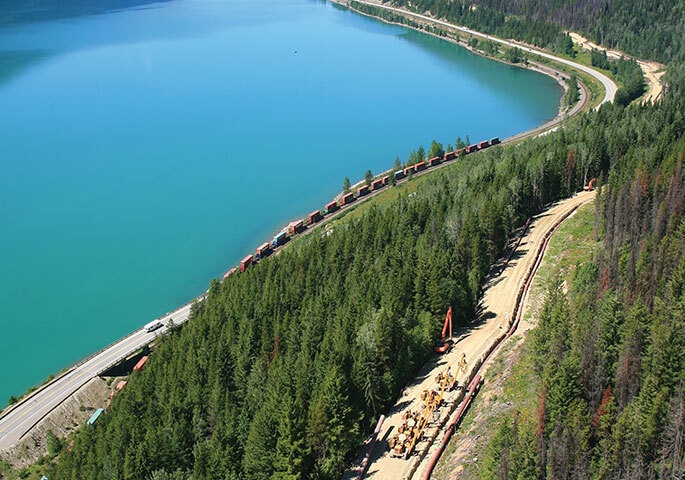 In 2004, Kinder Morgan began preparing for construction of a parallel line, and its completion in 2008 boosted Trans Mountain’s capacity to 300,000 bpd.